Last year, after a few decades of being too self-conscious to even put on a bathing suit, I mustered my courage and went swimming at a magnificent, Olympic-sized public pool just 15 minutes away. It's been there forever, and I never had a clue; amazing what hidden riches are often right under our noses. At first I could barely make it a few strokes, since I'd pretty much forgotten how to do a few strokes. With the generous help of YouTube videos, my body eventually remembered. I started going twice a week over the summer and by last August could, to my surprise, limp through one length of all 50 meters without getting out of breath. This summer, now, I can swim ten lengths with just a few breaks in between. I never imagined I'd be able to do such a thing. The feeling of gliding in rhythm, free and unencumbered, in a quiet, contained blue universe, is one of the best sensations I've ever known. But: In order to get to the pool I have to actually get out of bed, get dressed, ride the subway (for just a few minutes, but still), load my stuff in the locker, and then reverse the process when I'm done. I trek successfully to far less pleasant places all fall and winter, many also at that hour of day. But on so many beautiful swimming mornings the alarm goes off and I lay in bed and think: gah, I don't want to move. I imagine all the stages of travel; what seemed, the night before, like a quick, fun jaunt is now, suddenly, a formidable and onerous task. More times than not I do chose to get out of bed, and for hours afterwards my body and mind feel light and filled with breath. But other times, I roll over and am annoyed with myself all day long. Why can I be so resistant to something that's fun and good for me? I've come up with a million reasons, and almost as many solutions. But swimming is just one example of this habit, and I know I'm not alone. 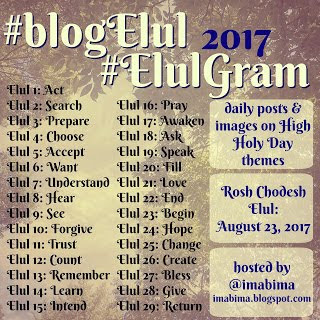 One of my tasks during this month of Elul is to examine those kinds of decisions, and figure out how to find the strength to choose goodness instead of fear or laziness.